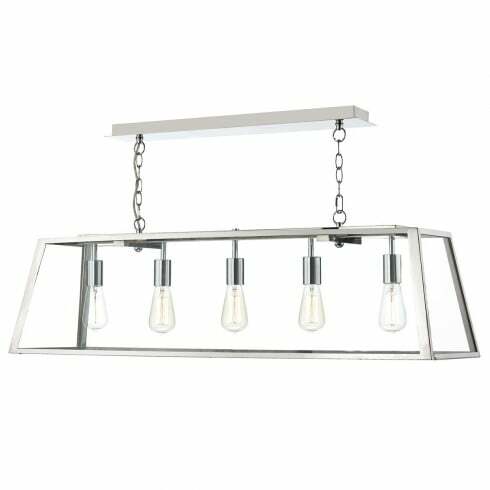 Dar Lighting Academy large 5 light ceiling fitting features a stainless steel box frame with clear glass panels that shelters the five lamps. It simple design is reminiscient of the lamps that were a common sight in factories during Britain's industrial era, but is now a favoured theme amongst interior designers. The product code for this Dar ceiling pendant is ACA0544. Giving a contemporary up-date to vintage style lighting this fitting is perfect for modern kitchens and bars whether they be in domestic or business settings. This item is double insulated and height is adjustable at the time of fitting. Also available in smaller-sized, 3 light black and stainless steel fittings, or as an alternative, please continue to browse through our selection of current industrial lighting.